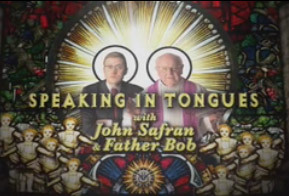 Speaking In Tongues, with John Safran And Father Bob, on SBS Television on Monday, at 9 pm is another reincarnation of the infinitely variable John Safran. Once again it’s mould-breaking, demonically-inspired television. EDIT: In an Australian first, SBS and Speaking in Tongues Pty Ltd are proud to announce the first video podcast of an Australian television program. Starting right now, you can get Speaking in Tongues delivered straight to your computer the day after each episode airs – free. It’s perfect if you’ve missed an episode, or just prefer to watch the program in your own time. You need software to go out and fetch the episodes. Free options include: iTunes 4.9 or newer, iPodderX or Juice Receiver. father bob is too nice to john and should stand up a bit more whats he going to do bob? just hit him or something he always picks on you so bite back. john safran is rad. i like the way he doesn’t care if he offends these easily offended people. its like, their opinion versus his opinion, and its funny how you can sometimes tell like if john says he has a slayer album he knows he might offend them, but yeah, he’s a sick c**t.
Could you send me more information about your service.. do you speak in unknown tongues which there is no translation for?